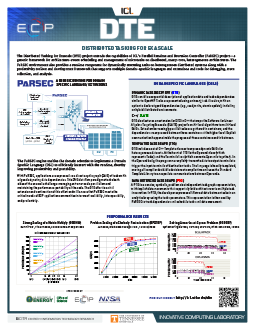 The Distributed Tasking for Exascale (DTE) project will extend the capabilities of ICL’s Parallel Runtime and Execution Controller (PaRSEC) project—a generic framework for architecture-aware scheduling and management of microtasks on distributed, many-core, heterogeneous architectures. The PaRSEC environment also provides a runtime component for dynamically executing tasks on heterogeneous distributed systems along with a productivity toolbox and development framework that supports multiple domain-specific languages and extensions and tools for debugging, trace collection, and analysis. With PaRSEC, applications are expressed as a direct acyclic graph (DAG) of tasks with edges designating data dependencies. This DAG dataflow paradigm attacks both sides of the exascale challenge: managing extreme-scale parallelism and maintaining the performance portability of the code. The DTE award is a vital extension and continuation of this effort and will ensure that PaRSEC meets the critical needs of ECP application communities in terms of scalability, interoperability, and productivity.